Cacciatore means “hunter” in Italian. In cooking, cacciatora refers to a meal prepared “hunter-style” with onions, herbs, usually tomatoes, often bell peppers, and sometimes wine. Cacciatore is popularly made with braised chicken or rabbit. 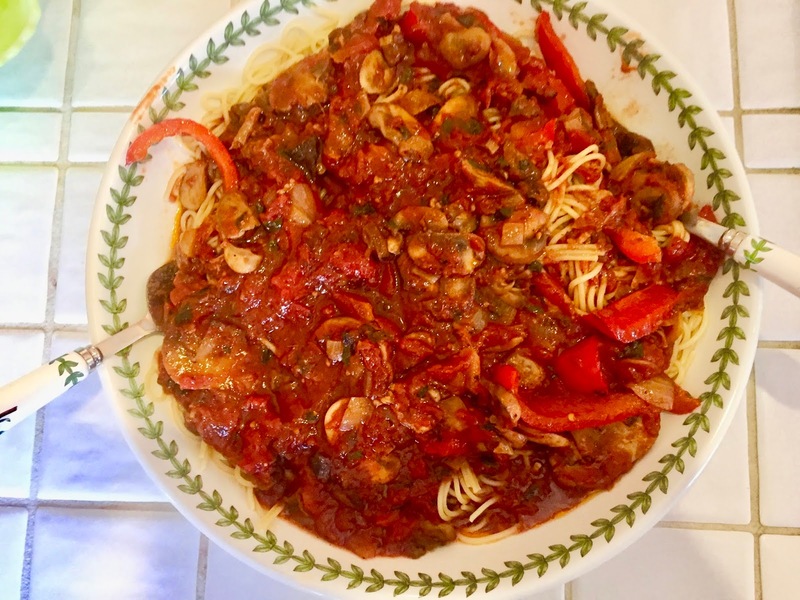 Growing up in an Italian American family with a mother who was an excellent cook I learned to make Chicken Cacciatore at a young age. My mother who is now 97 didn’t have a written recipe she just created as she cooked. I’ve tried to recreate her recipe adding porcini mushrooms her favorite. This recipe also double very well for a larger group. 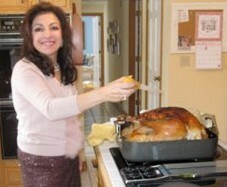 A few tips that I learned from my mother: Always soak chicken for about 10 minutes in salted water to clean. Then pat dry before cooking. 1 28-ounce can San Marzano tomatoes in juice, put through a food mill. I use Cento. Place the dried mushrooms in a bowl or heat-proof glass measuring cup and pour on 2 cups boiling water. Let sit 15 to 30 minutes, until mushrooms are softened. Drain through a strainer lined with cheesecloth or a paper towel and set over a bowl. Rinse the mushrooms in several changes of water, squeeze out excess water and chop coarsely. Set aside. Measure out 1 cup of the soaking liquid and set aside. Preheat oven to 375F. Heat 1 tablespoon of the olive oil over medium-high heat in a large, heavy nonstick skillet. Season the chicken with salt and pepper and brown, in batches, for 5 minutes on each side. Transfer the chicken pieces a roasting pan. Pour the fat off from the pan and discard. Turn the heat down to medium, add the remaining oil and the onion and pepper, as well as a pinch of salt. Cook, stirring, until the vegetables begin to soften, about 5 minutes. Add the garlic, parsley, rosemary, red pepper flakes and salt to taste. Cover, turn the heat to low and cook, stirring often, for 5 minutes, until the mixture is soft and aromatic. Stir in the fresh and dried mushrooms, turn the heat back up to medium, and cook, stirring, until the mushrooms are just tender, about 5 minutes. Season with salt and pepper. Stir in the wine and bring to a boil. Cook, stirring, for a few minutes, until the wine has reduced by about half. Add the tomatoes and salt and pepper to taste. Cook over medium heat for 5 to 10 minutes, stirring often, until the tomatoes have cooked down a little and smell fragrant. Stir in the mushroom soaking liquid that you set aside. Poor mushroom mixture over chicken. Bake at 400˚F uncovered for 45-55 minutes or until the chicken is cooked through (165˚F internal temp) and the sauce is bubbling. Taste, adjust seasoning and serve with pasta or rice.